Fish & Brewis is a traditional Newfoundland Specialty. 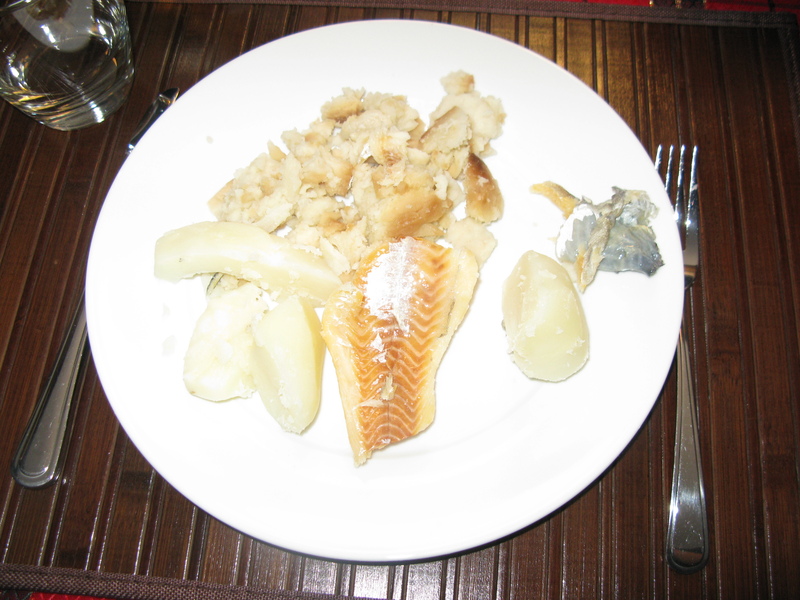 I enjoyed this meal of fish, brewis and boiled potatoes on January 5th, 2012. Soak Hard Bread overnight. Use lots of water. Soak cod-fish in a separate bowl overnight. In the morning change water and cook cod-fish for about 15 minutes. Remove from heat and drain. Put hard bread in saucepan with water to cover and bring to a boil. Remove Hard Bread from heat and drain. Optional Add cooked flaked fish and mix if you would like what is called Fisherman’s Brewis. Keep hot. Fry pork until golden brown and crisp, serve with fish and brews.). Drawn butter: melt butter in saucepan, add onions and fry until golden and soft. Do not brown. Sprinkle flour over mixture and mix thoroughly. Remove from heat. Stir in half water. Place on heat and bring to a boil, stirring constantly. Beat until shiny and smooth. Slowly add remaining water, cook over low heat 2 to 3 minutes. Serve over fish and brewis. My friends from Europe certainly enjoyed our traditional Newfoundland & Labrador cuisine. Posted on January 26, 2012, in Newfoundland Recipes and tagged Butter, cod, cook, fish, home, Onion, potato, salt pork. Bookmark the permalink. 1 Comment.